Two young people unfamiliar with each other, attaining the challenge of cycling through Europe... 7000 km from the most northern point to the most southern tip of the continent where the view engages with Africa. 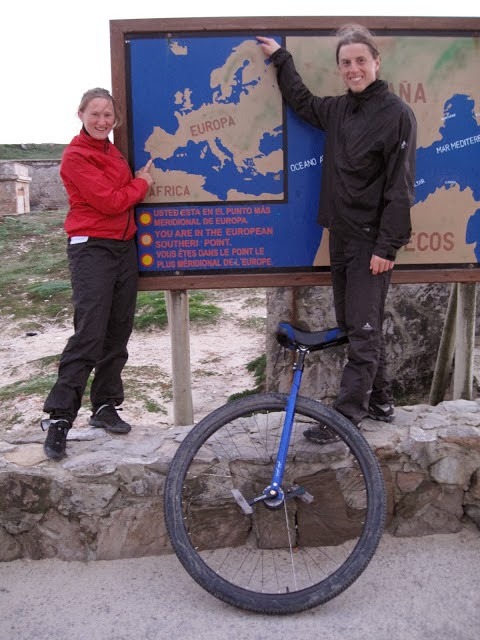 Jesper on a unicycle. Elin with all their luggage. Both with the mission to spread love and to inspire others to live their dreams. It all started with a couchrequest. Yes, I have something in my face. I was being mischevious and Jesper had his revenge smearing ice cream all over me, so I thought: "Why not cycle like this for a while. I'll continue looking happy and smile at people. Let's observe their reaction.."
The more south we get, the more we're missing the fresh air from up north. Every breath we took in northern Norway and northern Sweden made us feel like we had reborn! We've now entered the fourth country on our journey. Streets in big cities are covered with broken glass and everywhere people are stressing around with hanging heads. Gloomy faces eventually gazes at Jespers unicycle for a few seconds. They are rarely asking any questions nor smiling at us as during summer time. People seem so busy. Busy running around seeking happiness and "saving time"? The only way you can "save it" is to spend it well! Too many people spend money they haven't earned, to buy things they don't want, to impress on people they don't like. Autumn has definitely merged with the comeback to work but why all these sad spirits? Aren't people satisfied with their tasks? Haven't they had a refreshing holiday and recovered well enough? Are they letting their freedom getting more restricted and the roads of possibilities more narrow? If you're already longing 'til next vacation, maybe you should set up a life which you don't need to escape from? Remember: however you dress, wherever you live, whatever you do and wherefore you laugh, there will always be someone agreeing or disagreeing with you. Liking or disliking you. Curious of getting to know you and wanting to be your friend or not wanting to be near at all. So try being the best You and live the way You wish. Vad får er att bli glada? Kanske något du kan göra idag? Tack MickeGunnarsson för dina fina förslag! "Lycka är som ett tomtebloss. Det gnistrar till i livet och går inte att hålla fast." There are shoes in the air! "Why so?" I asked a german guy. He smiled at me and replied "I don't know, they've been hanging here in Fleichburg for a while and you can see the same in several other german cities. Nobody really knows where they're coming from or why. But at least it makes you smile!" Yes, I thought, at least it makes me smile! Here's a small glimpse of our two-days stay at SolensHjerte in Odense, the largest plant school in the Nordic region converted to a modern monastery. The food was delicious and the people were warm-hearted. Its family consists of just about 50 members from the age of 16. The place is spiritual and gives you space for personal growth. Many of the members has a regular job and many of them are divided and included in different tasks at the place. Each one of them is choosing that area which makes their heart sing. Areas such as interior design, cooking, cleaning and gardening..
Their philosophy is that what's most iportant in life is knowing youself from the inside. Therefore they're all working a lot with themselves. Some rules are general such as, taking off your shoes before entering the building, breakfast is served at 9.00, lunch at 13.00 and dinner at 18.00. Every day at 17.30 they hold a meditation and we were lucky to join one of them. Immediately after dinner we gathered with the group for cleaning up the dishes. As my hands were working and my thoughts after a while started wandering, someone suddenly shouted "knuse paus!!" I turned around and someone smiled and reached out. Surprised and nevertheless glad I threw myself into a warm, long hug..! "Knuse paus" means "hug-break" and is also one of their daily acts. Wonderful, isn't it! What if this was introduced to all schools and all workplaces! Well.. at least the possibility and the acceptance of it. But we like it this way. It was a decision we made before leaving and it kind of makes our journey more exciting! We simply have to trust that everything will work out. Until now it has worked out just fine :) We often find hosts through the magnificent network on CouchSurfing. Otherwise hotels and youth hostels have been glad to help us. We've often asked restaurants for food when we've gotten hungry and also they have contributed. And this is what it's all about. Helping each other. Contributing. Collaborating and sharing. Many of us tend to believe that we're independent. But we're not. We're only "independent" until the shops are closed. Our welfare is based on other peoples loss. While we're fighting to get the cheapest cucumber, bananas, fruits or whatever, other people are struggling to be able to provide us with these products. They work for a smaller salary every month only to be able to offer the cheapest products so the purchaser buyers shall continue importing from them. How many of us can say that he/she knows how to grow their own food, how to build and maintain their own houses, how to educate their children, how to make their own clothes and how to create and connect their own electricity? Even if one person is able to manage all the fields mentioned above, he/she would most likely have some issues concerning the time it would all take.. After all, there's only 24 hours in one day. So we actually need each other and we actually depend on each other. Many of us are also blinded by the fact that we Have to change our behaviour on this planet. We need to get away from our mass consuming culture. Our Mother Earth has the capacity to provide everybodies need. Not everyones desire. We need to start sharing. Sharing is caring. What comes around goes around and energy flows where attention goes. Be generous! For you who are curious, watch thismovie and try being open minded for new possibilities. If people realised that every small act counts, they wouldn't hesitate to take those small steps towards a better world. Can we afford not trying? I'm a lover of life. I'm a dancer in the dark. A thinker. A born optimist with a charismatic personality, channeling light from the sun, the moon & the stars. I'm a visionary & a doer. An artist with a lively imagination who makes many of my wishes come true. Both a wonderwoman & a gentle flower. Temat Resor. Temabilder från Flashworks. Använder Blogger.